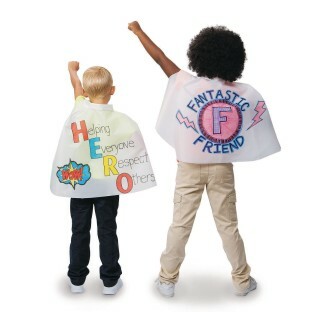 Super capes for super kids! The perfect pretend play art project - be a princess, pirate or even a bug! Super capes for super kids! Pretend to be a king, princess, pirate, Robin Hood – even a bug or fairy! Decorate durable white vinyl capes with fabric markers, paint, stickers and more, sold separately. Hook and loop closure. 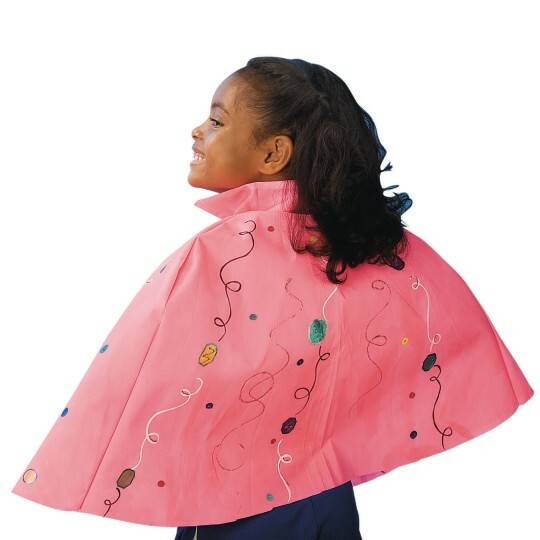 18"L capes are intended for children ages 2 to 5. 30"L Capes are also available (CM139). These cape are always a smash hit. We are a children's recreational facility. We use them in Art class and the kids love to decorate them and make them their own then we go into our gym and we running around pretending to fly. It is always a ton of fun! I would definitely buy this again! My students loved creating their own superhero capes! We used these capes for an art project in our elementary aged Art Academy. The kids loved decorating and wearing them! We created superhero capes for camp and the Velcro fasteners came apart before they left the building.